Keeneland has successfully developed the September sale into the largest international marketplace for Thoroughbred yearlings. But whether the sale will continue offering the kinds of horses European buyers want is up for debate. 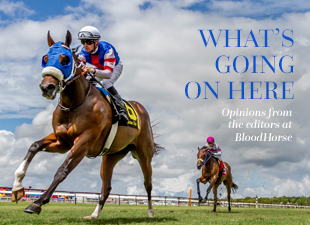 In this issue The Blood-Horse looks at how U. S.-bred horses have been faring in European group stakes (page 2624), and the trend is not encouraging for domestic breeders. In 1990 U.S.-bred horses won 32.8% of group races in England, Ireland, France, Germany, and Italy but have only won 6.8% of European group races in 2010 through Aug. 30. Some have speculated that the United States no longer has the stallions required to draw buyers from Europe and that this change has and will continue to affect our major sales. Geoffrey Russell, Keeneland’s director of sales, agrees that North America does not breed for a horse that can run a mile and a half on the grass. But he said there are plenty of North American bloodlines excelling in racing overseas. Case in point: One of the top-rated juvenile colts this year in Europe is Pathfork, a son of WinStar Farm stallion Distorted Humor out of the Sadler’s Wells mare Visions of Clarity. The colt is undefeated in two starts, and on Aug. 21 was stamped as one of the best when he won the Galileo E.B.F. Futurity Stakes (Ire-II) at the Curragh. Pathfork’s next start is Sept. 11 in the Boylesports.com Vincent O’Brien National Stakes (Ire-I). Bookmakers have the colt at 10-1 to win next year’s Two Thousand Guineas (Eng-I). Among the top juvenile fillies in Europe is Laughing Lashes, a daughter of Gainesway Farm stallion Mr. Greeley out of the Unbridled’s Song mare Adventure. The filly won the Keeneland Debutante Stakes (Ire-II) at the Curragh Aug. 8 and finished second in the Moyglare Stud Stakes (Ire-I) on Aug. 29. European buyers have been steadily active over the past decade at the Keeneland September sale. Between 2000 and 2007, European buyers, excluding the Maktoums, accounted for an average 23.2% of the total expenditures during Keeneland September’s select sessions. In 2007 alone European buyers contributed to 31.9% of the select sale gross. During 2000 the euro was much stronger against the U.S. dollar, with $1 equal to about €1.107 on the first Monday of September 2000. Since then, the currency exchange rate has shifted in favor of the Europeans. In 2007 the September exchange rate fell to €0.733, meaning a US$100,000 horse was only costing a European buyer €73,300. European spending has slipped over the past couple years, however. In 2008 European purchases at Keeneland September’s select sessions dropped to 20.2% of gross expenditures and fell again to 19.7% in 2009. Even though the exchange was even more favorable during those two years, the world economy also was in turmoil. As the economies around the world gradually improve, Russell expects to see more European participation—but not necessarily from England, Ireland, and France. Markets are dynamic, so it should not be surprising the same forces that brought the best European stallions to Kentucky for several decades are now spreading those quality horses around the world. But as the North American commercial market continues to heap the greatest rewards on dirt runners with precocious speed, let’s hope we retain enough diversity to stay competitive on the world stage.